8th Annual Women's Power Luncheon was a huge success! Fannie was born and raised in Louisiana. She received her undergrad degree at Southern University at Baton Rouge in dietology. She went on to get her master’s degree in Food Management from the University of Iowa in Iowa City. After graduating, she came to Aurora to work at the St. Charles Hospital and married her husband LeRoy. After giving birth to her first child, she decided not to go back to work at the hospital because she could not find day care for her son. He was not allowed in most daycares because he was black and she didn’t want to leave him at a person’s house where there were too many children for a home childcare provider to handle. The Nuns at the hospital wanted her to come back to work so urgently that they told her to bring her child and they would watch him while she worked. ​When the hospital closed, she went to work at the Geneva Girls School. From there she went to the St. Charles Juvenile Center for a short time. She then started consulting for the state of Illinois prison system. She eventually was asked by a department of corrections committee to completely take over the kitchen and manage all food service for the prisoners at Statesville in Joliet, IL. She originally was going to turn down the offer due to the condition of the kitchen, until a warden at the prison told her that she couldn’t do it, “stating that if a man can’t do it, a woman most certainly couldn’t.” Fannie took the position to prove that not only could she turn around the horrible state the food service department was in at the prison (dirty, disorganized, corruption in management, and staff unwilling to pull their weight), but also that she could do a fantastic job. When she took over, there was total revolt as the men didn’t want a female supervisor and especially didn’t want a woman telling them what to do. She had an entire staff walk out on her before a large meal was to be served. She had to work short staffed until she could hire people to help get the kitchen where it needed to be. She stayed with the Dept. of Corrections for a total of 27 years. She was able to get new and healthier foods ordered, bring in public health to assess cleaning, food safety and code needs, and eventually was given the opportunity to completely design a new kitchen that was built to better suit the needs of the staff and prisoners. Fannie ended up retiring from the Dept. of Corrections shortly after cancer took LeRoy’s life in 1998. That’s when she started her journey as a volunteer. In 1999 she began by taking Mutual Ground’s 60-hour domestic and sexual violence training in order to respond to hospital emergency calls. When she realized this would be too difficult for her emotionally, she began watering plants and flower gardens on the Mutual Ground property and eventually took over its clothing closet. She continues to volunteer almost daily in this capacity, while organizing a giant yard sale each summer that has grown to raise over $3,000 annually to help fund the shelter. In addition to the work she does at Mutual Ground, she has been volunteering at Hesed House cooking meals, cooking for the TLC guests every Christmas and she has been tutoring students in math and reading at Nancy Hill elementary school since 1999. To this day she loves working with the children of Nancy Hill, referring to them as “my little babies”. Fannie has also served food at Wayside Cross Ministries for close to 17 years. On top of all of these important volunteer responsibilities, she teaches a bible class at the Fox Valley Work Release Center weekly. Fannie (who we lovingly call Miss Fannie) takes on each day with grace and a truly grateful heart. She has come to know and care for our clients and greets almost everyone with a hug. She lights up our lives at Mutual Ground and surely does the same for the many other organizations who are lucky enough to have her true dedication and amazing spirit grace their doorstep. 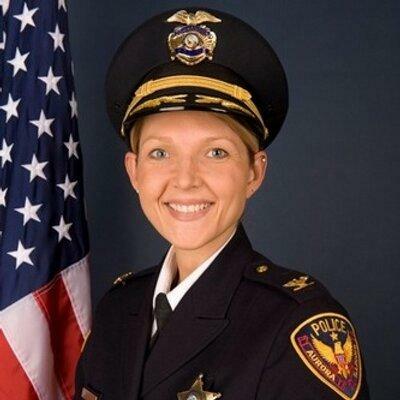 Aurora Police Chief Kristen Ziman was born and raised on the west side of Aurora. She is a graduate of West Aurora High School and started as a Police Cadet at the Aurora Police Department in 1991. She joined the Aurora Police force in 1994 as a sworn officer and worked in patrol, field training, community policing and investigations as a domestic violence detective before being promoted to sergeant in 2003. She was promoted to lieutenant in 2008 and to commander in 2010 and was named Police Chief in 2016. ​Kristen earned her Associates Degree from Waubonsee Community College. She holds a Bachelor’s Degree in Criminal Justice from Aurora University and a Master’s Degree in Criminal Justice Management from Boston University. She is a graduate of the FBI National Academy #249. She completed the Kellogg Women’s Senior Leadership Program at Northwestern University, Senior Executives in State and Local Government at the Harvard Kennedy School of Government, and the Senior Management Institute for Police. Kristen’s passion is writing and she has been a columnist for the Chicago Tribune Beacon News since 2008. She blogs about police-related topics and has been featured by the Illinois Association of Chiefs of Police and is among the top police blogs. Kristen also helped found Blue Courage, a two-day training course for police officers. She is a certified trainer for Franklin Covey’s 7 Habits for Law Enforcement, Franklin Covey’s Diversity Champions, The Nobility of Policing, and Customer Service for Police Officers. She is currently attending the Naval Postgraduate School in Monterey, California pursuing a second Master’s Degree in Homeland Security and Defense. Kristen lives in Aurora with her family. ​Liz Connelly’s career has been defined by her ability to develop a strategic vision, build high performing teams and lead complex businesses to deliver results. In her current role as the Head of J.P. Morgan's Healthcare, Higher Education and Not-For-Profit Commercial Banking business, Connelly leads a business that is national in scope and provides treasury, credit and specialized industry solutions to over 3000 clients. ​Prior to her current role, Liz joined Commercial Banking to manage a team of bankers across 25 states, covering hospitals and health systems, colleges and universities and not-for-profits in addition to state and local government. She has been with J.P. Morgan for 25 years, also having served for six years as the Midwest region head for the Private Wealth Management business. Her experience across financial services and her ability to manage complex businesses have enabled her to hold positions of increasing responsibility in the Investment Bank, Asset Management and Commercial Banking. ​​As a lifelong citizen of Chicago, some of Liz’s most rewarding achievements have come as a result of her community involvement. Coming from a family with a long tradition and history of public service across the city and the State of Illinois, Liz serves as a Director of the Chicago Network, Economic Club of Chicago, trustee for Polk Bros. Foundation, Shedd Aquarium, Harris Music and Dance Theater, Children's Home and Aid Society of Illinois, Steppenwolf Theatre and Catholic Extension. She is also a member of the Executives’ Club of Chicago. She is passionate about giving back and assiduous in balancing her career with her responsibility to these organizations. ​Liz received her B.S. in Foreign Service from Georgetown University and her M.B.A. from the J.L. Kellogg School of Management, Northwestern University. She enjoys traveling and spending time with her family. Liz lives on the north side of Chicago in Rogers Park with her husband Matt and their four children.